1.Preheat oven to 425°F. Heat large saucepot of salted water to boiling over high heat. Add potatoes and cook 12 minutes or until tender; drain. 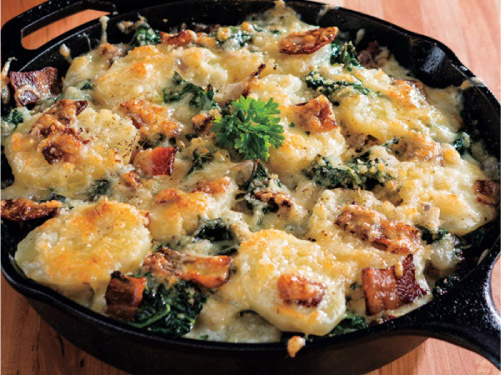 2.In large oven-safe skillet, heat butter over medium heat 1 minute; add bacon and cook 3 minutes. Add shallots and 1 teaspoon thyme; cook 4 minutes. Add garlic; cook 1 minute. Stir in chard; cook 3 minutes. Add cream and nutmeg; cook 5 minutes or until tender. Remove from heat; stir in salt and pepper. Add potatoes and carefully stir to coat; spread mixture evenly in skillet. 3.In small bowl combine cheese, oil and breadcrumbs; evenly sprinkle over potato mixture. Bake 25 minutes; sprinkle with parsley and remaining 1 teaspoon thyme. > Swiss chard stems can be roasted, sprinkled with sea salt and drizzled with a squeeze of fresh lemon juice for a tasty side dish.